Why HERSHE Aplus Breast Augmentation? A-plus breast augmentation uses the patient’s own fat cell to increase the volume of the breast. Engrafted fat cells are exactly same as the natural fat cells of the patient’s breast tissue, giving the most natural result after the procedure. Since this procedure is autologous fat transfer, it does not involve any foreign materials or implants to be inserted and does not leave any visible scar after the procedure. At the same time, body contouring is done as well as the doctor harvests healthy fat cells from unwanted area such as thigh or abdomen. HERSHE Aplus Breast Augmentation is DIFFERENT! thigh area. The patient requires certain amount of fat cells in the area for the procedure. most cases for optimal engraftment rate. 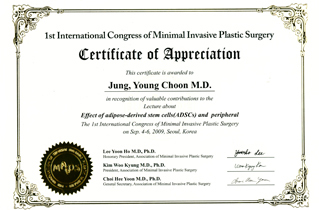 ​during the process for the Aplus breast augmentation. ​HERSHE Plastic Surgery's Aplus breast augmentation is autologous fat graft giving additional volume to the breast with fat cells same as the natural breast tissue. 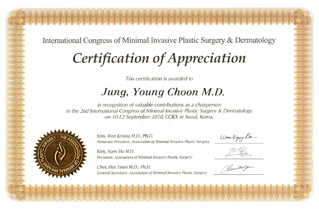 It is non-incision method which does not leave visible scar after the procedure, and almost no swelling and bruising takes place after the procedure which enables the patient to return to daily life immediately. Body contouring is another benefit of the procedure as the doctor harvests fat cells from unwanted area such as abdomen or thigh. (Most cases are done by thigh as the engraftment rate is the highest) Re-operation is rather simple as it only requires additional fat graft. However, compare to the conventional breast implant surgery, Not as much volume could be increased as the implant, and retouch might be necessary as the some percentage of grafted fat cells get absorped into the body due to the nature of the fat graft surgery. Also, this procedure is not suitale for skinny patient's who does not have much body fat. The most beneficial part of the implant surgery is that the result is predictable. The size and the shape of the implant is discussed throughly between​ the doctor and patient prior to the surgery, and the increased volume does not change after the operation. Large volume increasement could be made with implant surgery, and the implant could easily be removed if any complications should occur. However, compare to the autologous fat transplantion, the breast implant surgery requires foreign material to be inserted to the body which will require regular mammography. Thre recovery time is longer compare to the fat graft method, and it involves more pain during the recovery. Avoid bras. Using nursing bra is recommended in inevitable cases. Avoid sauna and exercise for 1~2 weeks after the procedure.